His season may be over, but Tebow Time has not run out. And if last night's news about the Madden NFL 13 cover is any indication, get ready to see a lot more of the Denver quarterback during the off-season. Tebow, who had a breakout season leading the Broncos to a division title and the playoffs, once again supplied fourth-quarter heroics to help his "Clutch Team" of all-pros claim Madden Bowl XVIII last night. 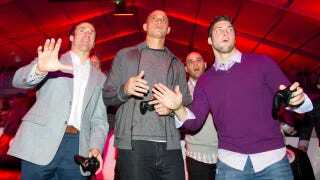 This time, Tebow (pictured above, right) was playing as a receiver in Madden NFL 12's 3-on-3 online team play mode. Drew Brees (above, left), who just finished a record-setting season at quarterback for New Orleans, was taking snaps for Clutch. Brees' teammate Jimmy Graham (above, center) lined up at running back. The three were battling the Rookies, comprising likely first round draft picks LaMichael James of Oregon, Justin Blackmon of Oklahoma State, and 2011 Heisman Trophy winner Robert Griffin III of Baylor. The Rookies looked poised to take the tournament title when they returned a fumble for a touchdown and a 13-9 lead late. Brees and Clutch regrouped, drove inside the 20 and, with 10 seconds left, Brees hit Tebow for a short touchdown pass for the final 16-13 margin and a win befitting their team name. It turns out Brees had called the wrong play. "I thought I called a run play, but it turned out to be a play action pass," Brees said. "Luckily there was still enough time on the clock for us to drive down the field after they scored. Wow. What a fun and crazy game." Brees' team lost in the final round of Madden Bowl XVII last year, making the win even sweeter this go around. "There's just something about having him on your team," Brees said. "He's just brings the magic. There's no other way to explain it." Tebow, the cover star of NCAA Football 11, and Brees, who held the cover of Madden NFL 11, are expected to be among a 64-player field when fans begin voting on the Madden NFL 13 cover in March. EA Sports is bringing back the playoff for a second year, after 13 million votes were cast in a tournament that produced Cleveland running back Peyton Hillis as the people's champion cover star for Madden NFL 12. Tebow was thrashed in the first round of that tournament, losing nearly 2-to-1 to Kansas City running back Jamaal Charles. But last year, Tebow also wasn't coming off the kind of season he just had, where his fourth-quarter comebacks in an unorthodox offense made him one of the league's most compelling stories week-to-week. The field will be announced on March 7. Teammates will be paired off in an initial "play-in" round to determine their franchise's representative. The winners then will be re-seeded into a 32-man, single-elimination bracket.